I sort through lots of reader emails throughout the week, most asking design related questions or tip seekers - Where can I find a ____? How should I display my ___? Of course, like a good little blogger, I reply to each and every email, sometimes spending hours researching the answer, but recently I got to thinking... Perhaps I need to post the question, along with my answer so everyone can benefit AND so you have a chance to showcase your pearls of wisdom by offering comments. Sound like a plan? 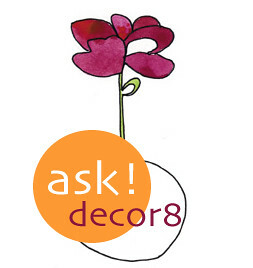 Be on the look out for the little "ask decor8" image (above) so you'll know that this is a question from a decor8 reader in need. :) Not all reader questions will result in a decor8 post, but I'll do my best to feature at least a few each week and others, I'll continue to answer one on one via email. First victim, err reader, actually arrived fresh this morning from Veronica. Can anyone help her out? "Have you seen any good ways to hang small prints? I don't want to traditionally frame (too expensive and boring) them. I sometimes use paper clamps from the office supply but..."
I have an idea. Why not find those transparent plastic clipboards (I call them ghostboards) and arrange 6 on the wall, 3 over 3. Clip your favorite photo or print, one print per clipboard. You may want to make sure it's not too small though (the print), so try something that is perhaps 5x7 or maybe 8x10. Just make sure all of the prints are the exact same size. Colorful or even black/white photos would be fun. This is an art project you could create on the cheap, too. Especially if you take decent photos. You could snap some close up pics of your favorite objects around the house or outside, clip, and viola! Insta-art! What do you think about this idea? 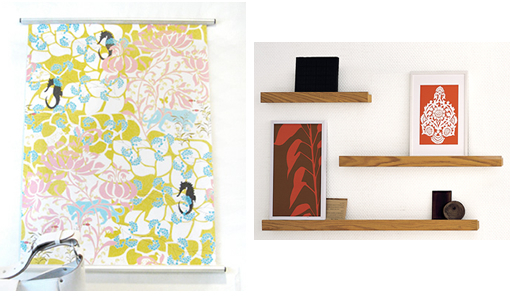 OR... you could create a clothes line for your wall out of wire and clip on various prints that you love. Not that original, I know, but it may look cute. I also like the idea of using this easy breezy poster hanger from Rare Device in Brooklyn, or these easy to install picture ledges from West Elm. All of the above suggestions are nice because you can rotate your art collection easily without banging up your walls and spending an entire afternoon on arrangement. decor8 readers - it's your turn! Can you offer some creative tips for Veronica?